If you’re a TapRooT® User, you know that drawing a SnapCharT® is the first step in your investigation whether it is for a low-to-medium risk incident or a major Investigation. What is a SnapCharT®? 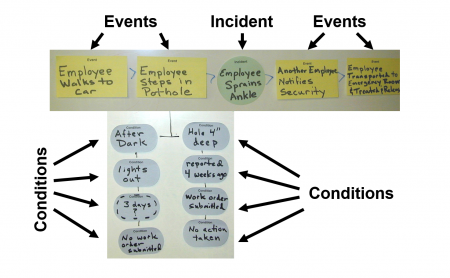 It is a timeline of events, a fact-finding tool that helps an investigator understand what happened. It is an investigator’s duty to support all the facts discovered on the SnapCharT® with evidence. Otherwise, the timeline is simply an assumption of events. One of the primary reasons investigators run into problems determining causal factors is because the sequence of events they developed was not supported by evidence. A SnapCharT® is a planning tool for evidence collection. It helps organize and understand what information is readily available and what needs to be collected immediately. A SnapCharT® helps an investigator establish a list of potential witnesses to interview. Also, instead of starting interviews with the generic, “Tell me what happened,” investigators can ask questions right off of their SnapCharT®s. These are only three ideas about how you can use a SnapCharT® for evidence collection. Did you know we offer a 2-day course on all of the advance techniques of evidence collection and interviewing? Learn about it here. We also have a new book, Evidence Collection and Interviewing Techniques to Sharpen Investigation Skills that will be released soon. Would you like to be added to the waiting list? Contact me at phillips@taproot.com and I will let you know as soon as it is added to our online store. Also, please don’t hesitate to contact me if you are interested in holding the course at your facility. As a co-developer of the course, I can answer your questions and help you determine if it’s a good fit.